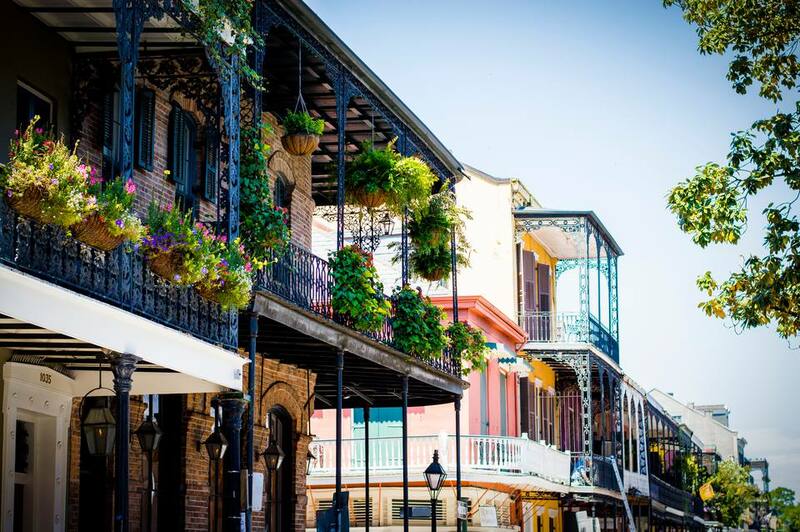 Only have two days to spend in New Orleans? Don't worry! You can see a lot of the city in that time, and you don't even have to run to do it. Here's a mini-itinerary for you—don't be afraid to shuffle and swap things to suit your tastes or needs! Start your morning in the French Quarter with a steaming hot cup of coffee and a crispy beignet (a sort of hole-less fried donut) at the world-famous Cafe du Monde. It's a little bit of a tourist trap, but not without good reason; the experience is one-of-a-kind and costs less than $5. After you've stuffed yourself with tasty, tasty carbs, walk across Decatur Street where you'll find a row of mule-drawn carriages just waiting for passengers. You can negotiate a bit with the driver, but expect to pay at least $25 for a half-hour tour. It's worth it. You get to ride around in comfort while your driver, a licensed tour guide, shows you the sights and helps you get your bearings in the neighborhood. Context, orientation, and entertainment—a good way to start your trip! When your carriage ride is finished, spend a few minutes just strolling around. Royal Street is great if you're into antiques. Don't miss MS Rau at 630 Royal. This shop deals in fine art and antiques, and often has things like paintings by Monet, Faberge eggs, and Tiffany glass pieces on display (and for sale, if your pockets are deep enough). You also might consider popping into the stunning St. Louis Cathedral, which is free for visitors and worth a stop. This church has been at the heart of the city since its founding and has borne witness to all of the beautiful and horrible things that have happened here. It won't be too long before you've worked up an appetite again (beignets burn off quickly). Stroll over to the Central Grocery for a muffuletta, a local favorite invented right there. The sandwich is heavy on the olives, so if you're not an olive fan, skip it and pick up one of the Quarter's many fine po-boys instead. Shrimp? Roast beef? Oysters? Ham? You choose. Find a bench in Jackson Square or along the riverfront at Woldenberg Park and people-watch while you nosh. Once you've finished, stroll over to Canal Street and pick up the streetcar. Get an unlimited day pass for $3 or a single ride for $1.25 (if you follow this itinerary exactly, you'll come out ahead with the day pass). You're riding the line with the red cars today, not the green ones. Make sure you board a car that says "City Park" and not the one that says "Cemeteries" because the line forks and we're headed to the park. Take the streetcar all the way to the end, where it'll drop you a short walk from the New Orleans Museum of Art and its stunning Besthoff Sculpture Garden. The museum houses the finest collection of art on the Gulf Coast, and the permanent collection includes pieces by Picasso, Miro, Monet, and many more. It also houses outstanding collections of Asian, Pacific, Native American, and African art, as well as fascinating rotating exhibits that represent a diverse range of artists, subjects, and media. The sculpture garden is free and worth a stroll, as well. The setting is just gorgeous, and it's a lovely place to spend an afternoon. And check out the park, as well. It's New Orleans' equivalent to New York's Central Park, and it's equally worth exploring. Once you've had your fill of art and the great outdoors, hop back on the streetcar and ride it back through Mid-City to Mandina's Restaurant. Get off the streetcar at Carrollton or Clark and walk the couple of blocks to the restaurant. You can't miss it; it's the big pink one with a neon sign. This venerable neighborhood institution serves up some of the finest Italian Creole food (yes, that's a thing) in the city, and you'll find it packed with locals every night—always a good sign! Hop back on the streetcar and back to the French Quarter, where you can jump off at Bourbon Street and gawk and stare as you stroll toward Preservation Hall. This famous club is the best place in the French Quarter (or the whole city, a lot of nights) to hear traditional jazz. They don't serve alcohol inside, so if the show leaves you dry, follow it up with a stop at Lafitte's Blacksmith Shop, allegedly the oldest bar in the United States or any of Bourbon Street's other fine (or not-so-fine—no one's judging) drinking establishments. Don't go too crazy, though, you've got a busy day ahead of you! Good morning, sunshine! How's that head? Get dressed in one of those generically nice all-black travel outfits that you've so wisely brought along (you'll need to look good later) and grease away any overindulgence with a hearty plate of Eggs Benedict or a decadent knife-and-fork breakfast sandwich at the Ruby Slipper on Canal Street (there's a location in the CBD on Magazine Street, too). The coffee flows freely and the service is cheerful, so it's a nice place to start a morning. Once you've chased away your hangover (or just, y'know, had a reasonable breakfast after a nice early night), hop on the St. Charles Streetcar (those are the green ones) and take it to Julia Street. Jump off and walk the couple of blocks over to the National WWII Museum. This extraordinary museum, particularly the newly-opened Freedom Pavilion, offers an eye-opening look at WWII, largely told through the stories of veterans themselves. Artifacts on display include My Gal Sal, a fully-restored B-17 bomber that's hung from the ceiling as if in flight. It's a fascinating place to visit, and one that honestly deserves more than a half-day, but see what you can while you're there and give yourself a reason to come back to the city. Stroll down the street and around the corner to catch lunch at Cochon Butcher. This casual outpost of local celebrity chef Donald Link serves up the best sandwiches in town (and this is a town full of great sandwiches). It's small, crowded, and noisy, but absolutely worth it. Once you're stuffed (again, it's sort of how things go around here), hoof it back to the streetcar and ride down the beautiful St. Charles Avenue, gaping at the ornate and glorious mansions that line the oak-draped street. If it's still a couple of hours before 3:00, feel free to ride all the way out to the end of the line and back. If you're cutting it close on time, jump off at Washington Street (or a stop or two down the line) and stroll into the hub of the Garden District, around Washington and Prytania. Here you'll find Lafayette Cemetery No. 1, one of the city's oldest and most beautiful cemeteries. It gets locked up at 3:00, so you'll want to get in there with at least a half-hour to spare. It's not enormous, but it can be great fun to meander slowly through the lanes, reading the names and learning about the people who are at rest here. It's more peaceful than eerie, so don't be afraid. After you've checked out the cemetery, head out for a walking tour of the neighborhood. Certified local tour guides often take groups around departing from the cemetery gates, and if you haven't planned ahead, you can still sometimes pay cash and jump on board with one of these groups. If you'd rather DIY, you can either just head out blind (plaques in front of many of the houses will keep you pretty well informed) or you can stop into the Garden District Book Shop and buy one of the many books on their shelves that contains a map and suggestions for a self-guided walking tour. It's easy to spend a few hours just ambling around this leafy neighborhood, and there's no reason not to take your time here. This is one of those times when the journey—in this case, a simple walk—is the good part, regardless of whether or not there's any real destination. When you've had your fill of cracked sidewalks and mansion-gawking, take yourself out for one of the best dinners of your life at Commander's Palace. This old-line Creole restaurant has been continuously operating at the heart of the Garden District since 1880, and celebrity chefs like Emeril Legasse and Paul Prudhomme made their bones in this kitchen. Chef Tory McPhail is now at the helm and brings a clean, modern aesthetic and a farm-to-table mentality to classic New Orleans dishes. Commander's regularly makes the cut on hyperbolic lists of best restaurants in the world, and deservedly so. If you still want a little more New Orleans after dinner, grab a cab to one of the city's legendary nightclubs. Tipitina's is a good choice, especially if someone local is playing. The Maple Leaf and Le Bon Temps Roule are both on this side of town, as well, and their calendars are worth a peek—if it's Tuesday, the Rebirth Brass Band will probably be at the former, and if it's Thursday, the Soul Rebels Brass Band will probably be at the latter. Both come highly recommended. If all else fails, you can just cab it across town to Frenchmen Street, where there's guaranteed to be something good playing in one of the many fine clubs on that trip.